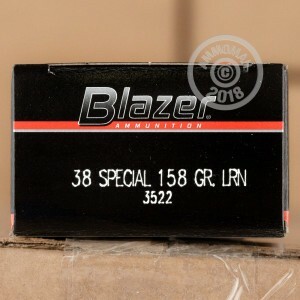 This .38 Special ammunition from CCI's Blazer series is an inexpensive range load that delivers good accuracy for outdoor target shooting and doesn't come with any expensive frills that drive costs up. 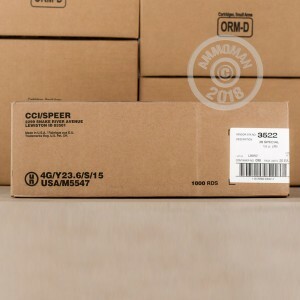 Each cartridge in this box of 50 propels a 158 grain lead round nose bullet to about 755 feet per second out of the muzzle. Lead round nose bullets are known for delivering good accuracy at a minimal cost, but are not permitted at many indoor ranges. Check with your range if you plan to shoot indoors. 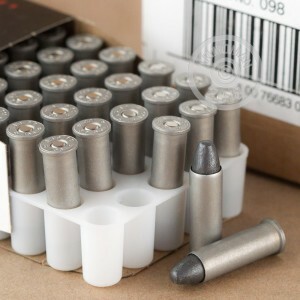 These cartridges are manufactured in Lewiston, Idaho and use non-corrosive Berdan primers and non-reloadable aluminum casings.